I was out shopping the other day and I realized I was wearing almost exactly the same outfit I posted about last year, but with a striped shirt instead of polka dots. Naturally, I had to visit the only thing missing from my outfit: my dream bag, the CHLOÉ Marcie satchel. You guys. It is SO GOOD. But then so is the Faye. And the Drew. I love the whole CHLOÉ collection. 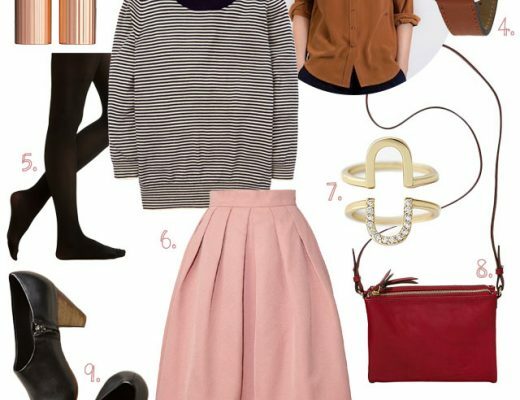 A little alert though — Frye has a beautiful bag (#7 below) that would fit right in, style-wise. It’s not inexpensive at $400, but considering that the others I love are all around the $2000 mark, it is definitely more attainable. So then I started looking around, wondering what else was out there. 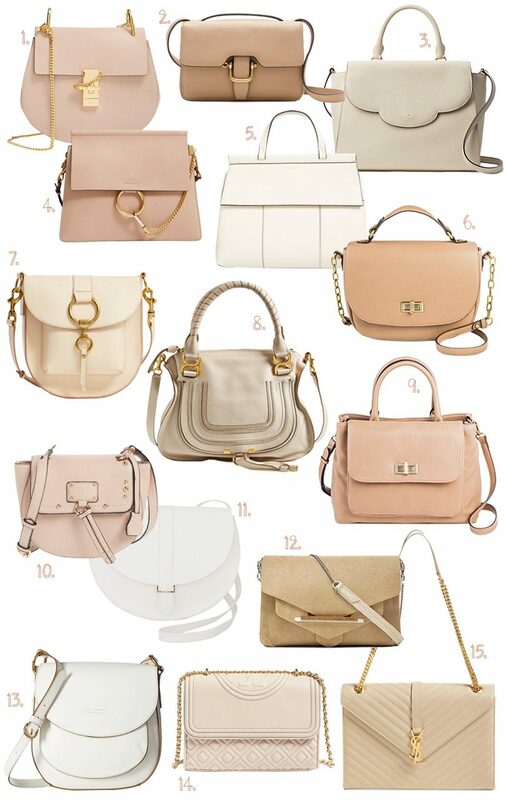 I found 15 bags in a range of prices that I’m super into right now for spring and summer! Clearly, I have a preferred color palette here. 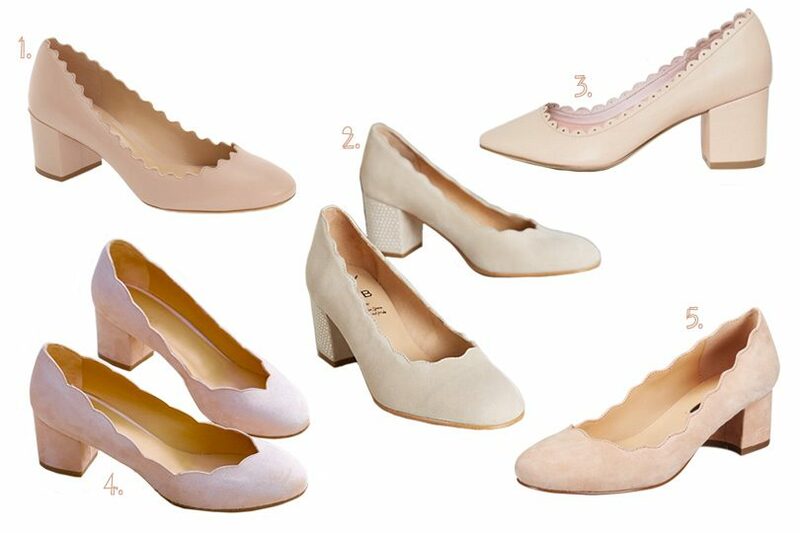 CHLOÉ kills it with these scalloped pumps, too. Low vamp, cute details without being too cutesy, and the perfect walkable heel. I found a few alternatives at a lower price point, though I’d be wary of the comfort and quality of the cheapest ones (potential ouch factor). OK, talk to me. Who buys luxury bags and shoes? I’m all for the ‘buy better, not more’ concept, but I’ve been happy in that midrange level with the quality. I get that you pay more for a name — but is the quality that much better? I see the value in a hand-knotted wool rug and I understand why they’re priced as they are, but I’m a little out of my element on the fashion side! I don’t know about “luxury”, but I definitely will go for a more expensive “heritage” item that 1) comes from a company whose history I admire, 2) was made using the same techniques as their original older products (ie handmade) and 3) will last ages. Case in point: I recently bought Red Wings chelsea boots on the recommendation of my brother (of all people!) since they’ve revamped their women’s collection. They were the most expensive shoes I’ve ever bought, but totally worth it since they were leather, made in the US, and get even better with age. I put them through the ringer this past “winter” (I live in LA hah), and they’re honestly the best, most comfortable shoes I’ve ever owned. I think there’s simply a huge markup on designer handbags. Granted, the quality is better than H&M, but it’s not worth it to me to spend 1000$ on a handbag. I’d much rather find an independent designer (on Etsy or the like) to support than a major luxury brand (just discovered this one: https://www.etsy.com/shop/MeitaLev?ref=l2-shopheader-name). Better price, supporting independent business owner, more unexpected, and good quality. I have been buying bags and shoes from consignment shops online and (very carefully) from ebay, and I have been very happy with my purchases. I have gotten some shoes from The Real Real and Bag Borrow or Steal; both of these authenticate the items. I bought a designer bag from ebay, but I did a lot of homework and knew what to look for in terms of authenticity. I just can’t see paying designer prices for something that is going to get worn or used anyway. I want to hear comments on this too, and yes because that bag still sings to me. I visited it and it’s siblings at bloomingdales last month, but no I don’t know what the difference is from the $400 no name Brazilian leather bag I happened upon and have loved since fall. Just the singing I guess? But oh my Marcie. Have you checked out Cuyana? Price point is on the higher range (around $200-$400), but the quality and structure of the bag rivals a much higher end purse. It’s also nice having a purse made in San Francisco with Italian leather. Sooo… I have a Chloe Marcie. It’s the medium with the shoulder strap. (It needs the shoulder strap to give more carrying options.) I’ve had mine for a little over a year and it’s only gotten better with time. I used to swear by B. Makowsky bags. (Still love them for the price point, especially since you can get them at Marshalls for a lot less. Think $50-$200 a bag that will last a season and has butter soft leather and heavy hardware.) I decided to get two pricy bags and carry them for years, rather than for a season or two. A Louis Vuitton GM bag and the medium Chloe Marcie. I bought both certified euc. And I’m so glad I did. I’m careful with the Louis, but the Marcie I bang into everything, let my child help carry, over-stuff it, cream it under my arm… You get the idea. It holds up. My Marcie is red. (A look at me bag in a look at me seasonless color…) The dye has never rubbed off, the hardware is solid and beautiful, the lining durable, the handles perfect. The only thing I don’t do is set my bags on the ground- icky. If you love the bag and want an investment piece, go for it. And look for certified used if you want to pay about half the new cost. For me, I’ll carry the bag long after it’s trendiness has gone, and I’m pretty confident that it will still look wonderful. I’ve followed your blog for a long time and I really miss your frequent outfit posts. These are lovely and beautiful options. Thanks for sharing! So I used to be into cheap and stylish. I’m now pushing 40 and am way beyond that, although not in the Chloe range. I consider a Kate Spade a splurge and an investment and tend to go with those for my purses now, and I tend to stick with the 100-200 range for shoes although I always shop and get them for a bargain. Case in point: all of my heels are either Aldo or Banana Republic but I got them all on clearance for 50 or less. Most of them are $200 retail. I take good care of them and they are timeless shoes. One day I will be able to afford Lanvin and Chloe but even then I don’t know if I will purchase them. Also because I sell Stella and Dot jewelry, I purchase only that and let me tell you- it lasts.